How Do We Use Your Donated Items? At LifePath, people often ask us what we need! So many caring community members know our work and our mission, and are passionate about helping those experiencing poverty and homelessness in our community. We feel privileged to be the beneficiary of support from these concerned, aware individuals. They may know that in the 17401 zip code, over 37% of residents are below the poverty line, whether or not they are experiencing homelessness. Often, these individuals have to choose between paying the rent or buying groceries. Covering the electric bill or purchasing their prescription medications. Impossible choices. At LifePath Christian Ministries, our mission is to step in when these impossible choices present themselves, and to meet people where they are, with housing and guest services to help with the necessities of life. We receive $0 in government funding, so we depend on private donations to pay for our entire operations budget. Our donors are our lifeline, and in more than 50 years of ministry (formerly as the York Rescue Mission), we have been blessed with the generosity of those who care about this mission. As little as $2.17 will pay for a meal in our cafeteria, where we serve 3 meals a day. In 2018, we served more than 180,000 meals. Donate HERE. Volunteers also help keep LifePath going. In 2018, 912 volunteers worked 12,141 hours, serving in our cafeteria, working in our Thrift Stores, sorting books for our Book Sale fundraiser, and working at York Giving, our Thanksgiving meal box effort in cooperation with Catholic Harvest Food Pantry. Sign up to volunteer HERE and learn more about how to serve. There are items that we need in order to keep our operations going. Those items are so very crucial, and are always updated on our WISH LIST and posted on our website. You can be sure that your donations (or your organization’s collection) from this list will make a huge difference in the life of our Ministry. These items may be dropped off at 371 W. Market St. between 8 a.m. and 4 p.m. Monday – Friday. Our Voucher Program makes it possible for us to give clothing and household items to our guests who are in need. Guests may sign up for vouchers every Monday from 1-3 p.m. at 367 W. Market St. Vouchers are taken by the guest to our Thrift Stores, where they use them for clothing, furniture, and other necessary items. 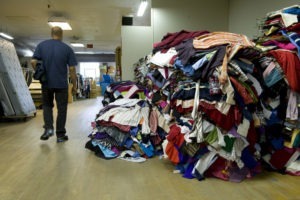 Other donated items are sold at our Thrift Stores to directly pay for the work we are doing. Proceeds from sales there go toward our Meals Ministry, operation of our two Shelters, and to materials and instruction of classes in our Learning Center. Over 30% of our operating budget comes from these proceeds. It’s important to know that when you make a $20 purchase at one of our stores, your money pays for 10 meals in our cafeteria. We couldn’t be more grateful for all of the ways that our community supports us at LifePath. Without you, we simply couldn’t keep our doors open. LifePath Christian Ministries is a 501 (c)(3). 65% of all gifts are put back into life-changing programs.